She started to learn how to play the piano at 4 years old. When she was 12 she became absorbed in Western music, starting with the Beatles, Carpenters, and Eagles. She joined a top level chorus group in Japan and won gold medals for the “Japan National Chorus Competition” 3 years in a row. She went to study in the US by herself when she was 18, majoring in composition. Not merely content with only the classical style, she started to write music of pop and rock. At the same time, she started to play the guitar and drums. She won the first prize in the composition contest in her university. 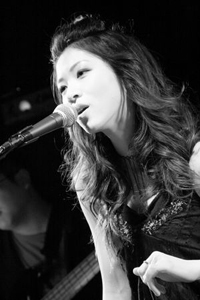 After coming back to Japan, she started to work in areas such as writing BGM, voice training and performing in bars. After several band experiences, she became a solo singer. Now she works as a composer, teacher, and singer-songwriter. Her works include music for TV dramas, commercials, and movies. Copyright (C) 2017 Jirafa. All Rights Reserved.